Auxin exerts pleiotropic effects on plant growth and development by regulating the expression of early auxin-responsive genes of auxin/indoleacetic acid (Aux/IAA), small auxin-up RNA, and GH3 classes. These genes have been studied extensively in dicots like soybean and Arabidopsis. We had earlier characterized a cDNA of the first monocot member of Aux/IAA family from rice. The achievement of the large scale rice genome sequencing combined with the availability of full-length cDNA sequences from Knowledge-based Oryza Molecular Biological Encyclopedia provided us the opportunity to draw up the first comprehensive list of Aux/IAA genes in a monocot. By screening the available databases, we have identified 31 Aux/IAA genes having high sequence identity within the conserved domains I, II, III, and IV. The genomic organization as well as chromosomal location of all the Oryza sativa indoleacetic acid (OsIAA) genes is reported. The rice Aux/IAA proteins can be classified in two groups (A and B) on the basis of their phylogenetic relationship with Arabidopsis Aux/IAA proteins. An evolutionary pattern of the rice Aux/IAA genes has been discussed by analyzing their structure (exon/intron organization) and duplications. Interestingly, the duplication of rice Aux/IAA genes was found to be associated with chromosomal block duplication events in rice. The in-silico analysis has been complemented with real-time polymerase chain reaction analysis to quantify transcript levels of all Aux/IAA family members. OsIAA genes showed differential and overlapping organ-specific expression patterns in light- and dark-grown seedlings/plants. Although auxin enhanced the transcript abundance of most of the OsIAA genes, the effect was more pronounced on OsIAA9, 14, 19, 20, 24, and 31. These results provide a foundation for future studies on elucidating the precise role of rice Aux/IAA genes in early steps of auxin signal transduction. Supplementary material is available in the online version of this article at http://dx.doi.org/10.1007/s10142-005-0005-0. MJ acknowledges the award of Senior Research Fellowship from the Council of Scientific and Industrial Research, New Delhi. This research work was financially supported by the Department of Biotechnology, Government of India, and the University Grants Commission, New Delhi. 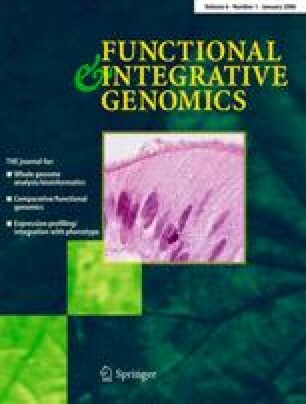 We gratefully acknowledge the KOME, TAIR, TIGR, and the IRGSP database resources for availability of detailed sequence information on rice and Arabidopsis.